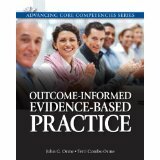 This chapter discusses the use of standardized measures for monitoring client outcomes. We begin by providing an overview and some examples of standardized measures, followed by a discussion of issues involved in the evaluation and selection of appropriate standardized measures. We also discuss issues involved in deciding when, where, and how often to collect data using standardized measures, and who should collect and record the data. Using an exemplar measure, we then demonstrate and discuss the scoring and interpretation of standardized measures. Finally, we discuss issues of diversity in relation to the selection and use of standardized measures, providing examples through discussions related to African-American, American Indian, and Hispanic clients.